Although I baked these cookies three weeks ago, I'm hurrying to write this post in the remaining few minutes of Tuesday. Hurrying, that is, after I have procrastinated and found countless excuses to postpone sitting down at the keyboard. The reason for my hesitation? This post is all about milestones and their accompanying transitions. The first milestone: My 500th post! 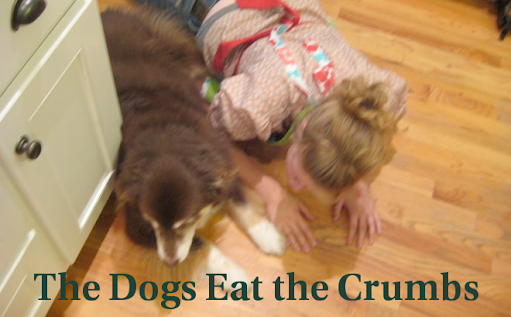 This is the 500th time that I've filled a blank white box on the computer screen with words and images and shared it electronically under the banner of The Dogs Eat the Crumbs. 500 is a big round number so it's a good reason to pause for thought. But there's an even bigger reason to pause, and to think, remember, sigh, dab the corner of the eye. The second milestone of today: the baking group Tuesdays With Dorie has reached the final recipe in Dorie Greenspan's book, Baking; From My Home to Yours. Tuesdays With Dorie began on the first Tuesday of 2008 with two or three bakers joining Laurie (of the blog Slush) in her invitation to bake through all of Dorie's Baking. Today, the last Tuesday of 2011, the group finishes the book. The group has assigned every recipe in the four years of Tuesdays, and I'm guessing that at least one baker in the group may have completed the entire book. I have baked every recipe since I joined TWD in July of 2008, but there were seven months of recipes chosen before I was a member. It's impossible for me to come this far and not finish the task so even though the TWD group is finished with the book I intend to bake all of the recipes that I missed, beginning next Tuesday. I'll bake them in the order that they were originally chosen, and post them on the corresponding Tuesday to their original baking date. Given that schedule, I'll finish all of the recipes in July. That will be a momentous day, but it will not touch the bittersweet feeling that has haunted me all day today - the final day of the group. The past four years have brought some of the most challenging and busy times of my life. I've dealt with joy and loss, with extended periods of travel, and months and months of ongoing renovations in my house. Making sure I published a blog post for TWD every single week - on Tuesday - and planning my schedule so that I could bake ahead if necessary - gave me a steady outlet for much needed creative activity. And there was something else: the support of dozens of other bakers, who offered encouragement, tips, comments and support, for matters in the kitchen and out. It is this original community of TWD bakers that is ending (even as plans are being made for a second round of TWD to begin in February 2012, using Dorie's book Baking With Julia.) Dorie wrote a lovely post on her blog today about the ending of TWD, and the connections we all have made over our common experience of baking her recipes. I have been fortunate to have met about a score of TWD bakers in real life in the past several years. I previously wrote about the TWD friendships and about being interviewed about the TWD community for O Magazine. Not all of the bakers will continue in the new version of Tuesdays With Dorie. And while the new book will have wonderful recipes, and present even greater technical challenges, the freshness of our shared experience of "I really can bake that successfully" or "Wow, that was such a failure" is behind us. Thanks to Dorie's steady guidance and the support of fellow bakers, we've all become much more competent and confident in our own kitchens. Transitions are often difficult, and this one has made me quite sad. I'll miss the sense of purpose of the original TWD community: the weekly rhythm of writing, posting, comparing notes with many other baking buddies, and then stealing the time to visit other blogs to see, read, and leave comments. And now, onto the week's recipe: Kids' Thumbprint Cookies. - Dorie herself is the host for this last recipe of the TWD group. You can find the recipe, and a lovely reflection about what TWD has meant to her (she calls it "the end of a delicious journey") on Dorie's blog post today. - I baked these cookies with my daughter JDE and our friend JH in a marathon Christmas cookie-baking session. It felt so right to be baking and sharing these cookies. JDE was responsible for getting me started in TWD in the first place, and JH has been one of my blog's most loyal readers over the past several years. - After a little bit of debate, we skipped the egg white wash + chopped peanuts on outside of the cookies. I knew I would like the texture better without the crunch peanuts, but the peanuts make the cookies look quite festive. - Our cookies baked faster than the recipe; we had to watch them for doneness beginning at 9 minutes. When they were out of the oven and still hot, I pressed the indentation again, to make sure there was plenty of room for jam (the cookies puffed when in the oven). - We had one "awkward batch," the one where the oven got turned off and I didn't realize it until the cookies had been baking in a - cooling - oven for a while. Then I turned the oven back on and got distracted looking for cookie cutters for another recipe and JH had to remind me of the cookies in the oven. The ended up just a little browned and crispy, and I managed to ruin several of them by poking holes all the way through them so they resembled little donuts and wouldn't hold any jam. - I grew up eating peanut butter and jelly sandwiches and so did my daughters. My mom always bought grape jelly but I used strawberry jam for my girls' sandwiches. For these cookies I used both flavors of jam: a jar of French strawberry preserves for most of the cookies, and a few cookies got the remaining drops of a jar of muscadine grape jelly that my daughter ALE had made last year. One bite and I knew exactly why Dorie called these thumbprints for kids: they taste exactly like a pb+jam sandwich in cookie form. The cookies were even better when they sat for a day or so. They were tender and delicately peanutty in flavor, with an intense jolt of strawberry (or grape) from the boiled jam. I loved this recipe, and I loved being a member of the Tuesdays With Dorie group! and finally, Thank you fellow bakers and friends and readers for sharing the sweet journey of Tuesdays With Dorie! I feel lucky that I'm the first person to comment because you were the first person to visit my blog! I remember that you made a point of welcoming new members to TWD, and how encouraging (and thrilling!) that was. Congratulations on your achievement(s)!! I've learned a lot from you and it's been so nice to get to know you. Wow 5oo posts..that is awesome! Your cookies look perfect! Im glad you liked them! It's been a fun experience baking with TWD! I have ejoyed visiting your blog. Thank you for all the comments over the years! Dear Nancy, thank you for your great 500 posts ! The cookies were lovely even if I never had a pb and jelly sandwich ! You are right about finishing the book, I should too... I wish you and your family a great new year ! Congrats on your 500th post! A momentous achievement indeed. Your thumbprints turned out great. It's been great baking with you for the last few years. Wow 500 posts! That is quite an accomplishment. YOu have been an inspiration to me along the way. We joined about the same time, but you are a better baker than I am! I hope we can meet in person one day soon since we live so close. Enjoy our twitter chats as well. Happy new year to you and yours. ahhh, how bittersweet. thanks for sharing, nancy. Oh it's making me so sad that the end is here! It's wonderful to read about everyone's experiences and I am grateful to have met so many wonderful people. I have truly looked forward to your posts and can't wait to see the rest of the recipes from you- thank you! Nancy, I've so enjoyed your shared wisdom and guidance over the last few years. You always inspire me. Looking forward to baking together in the future! 500!?! That's quite the accomplishment. Congratulations! I look forward to your next 500 posts! Lovely post! I've had such a great time baking along with you (and lots of others) Your posts are always filled with great advice and good humor. Congrats on 500 posts! Post was worth waiting for! 500 is quite an accomplishment. I know there have been times when you just wasn't "feeling it" but you soldiered on and I am VERYglad you did. I am glad to have made a friendship here and will always cherish it! NOW!! Onto BWJ and finishing TWD!! Congratulations on your 500th post! That's actually so amazing! These cookies, by the way, look delicious. I need to make these! The 500 posts wins you an iPad! (I've heard)... nicely done Nancy - it's been such a joy meeting you and P&Q'ing, and baking and tweeting and . . . . I threw myself in the BWJ ring - I hope you do as well, won't be the same! Lovely cookies!!! Homemade jam is he best!!! Wow! 500 posts! Milestones are reminders that achievements have been made. Happy baking in 2012! After reading about your wonderful "Baking" journey I can't imagine why you thought you were not motivated. Perhaps reality of the end of that journey was the bittersweet part of the composition. I thoroughly enjoyed reading your thoughts and by golly, I may just make some PB & J thumbprint cookies myself. Thanks for sharing, Nancy. Lovely post. Congratulations on an impressive milestone! I admit, the first thing I did was go check how many posts I have--not quite 400. =) Whether or not you decide to bake through the next book, I'm sure we'll continue to bake together. I look forward to it! congratulations on #500, and on making it to the finale! i've loved reading your notes and tips for each weeks' recipes.